God has put the works of His hands under our feet – are we treading softly on them? 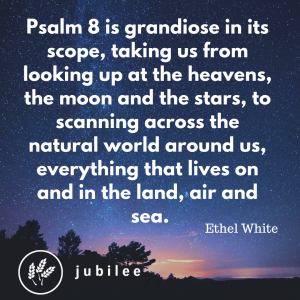 Jubilee’s Ethel White examines the scope of Psalm 8 and our call to steward the land. Have we given enough thought to this role and responsibility? Do we even notice what is ‘under our feet’? TV programmes about the natural world are delightful and stimulate us to consider our impact on the natural world, but how does this fit into our discipleship, how we live as followers of Jesus? We can’t evade our accountability by saying that we’re not farmers with flocks of sheep and herds of cattle. Everything we eat, apart from sea food, has its origins on the land somewhere in the world. So, at its most fundamental, most of our food comes directly or indirectly from what’s ‘under our feet’. As ‘rulers’, ‘managers’, ‘stewards’, or however we understand what ‘ruling’ involves, we need to pay attention to the origin of, the human and animal welfare issues concerned with, and the environmental impacts of, our food production and supply processes and systems. Psalm 8 is grandiose in its scope, taking us from looking up at the heavens, the moon and the stars, to scanning across the natural world around us, everything that lives on and in the land, air and sea. 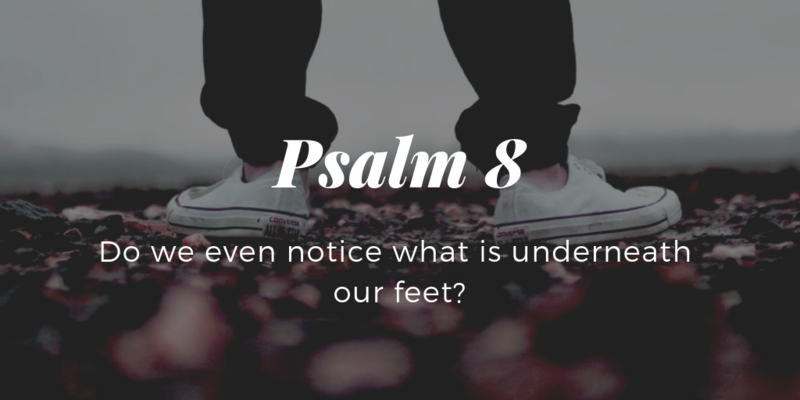 The psalm helps us to consider and grasp where we fit into God’s grand scheme of things. Its poetic language starkly contrasts our smallness – think of the pale blue dot as Voyager 1 looked back at the Solar System in 1990 – with the role and responsibility He has given us. As humanity He has made us ‘rulers over works of [His] hands’ (NIV v6) and ‘put everything under [our] feet’ (v6). Elsewhere in the Bible God portrays Himself as the vulnerable lover wooing His people, who are trampling all over His feelings (for example, the book of Hosea). The God who loves us, who as Jesus gave Himself for us, tells us in Psalm 8 that the natural world is also His gift to us. As His beloved people, who are trying to respond to His love and show Him how much we love Him, we would do well to give thought to how we use and abuse the natural world. Our food, all our material possessions, the energy that powers our lives, all originate in the natural world, i.e. from ‘under our feet’. How do we ‘tread softly’ on what is precious to God?